Hey Folks, If you have an iPhone or Android device go to your store and find “AVENZA” and down load it. 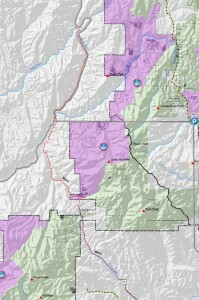 THEN download the Payette National Forest Winter Travel Map. This is what we have been waiting for. That Blue GPS dot will tell you exactly where you are at any time. Best of All, It is FREE! Map sponsored by many sources including our local clubs and the Idaho State Snowmobile Association. Thank You Payette National Forest for this effort! The maps show non-groomed trails marked in black on them and these trails can usually be found by the tracks leading into the areas. Take them at your own risk and use common sense when climbing and boondocking and be a aware of avalanche dangers. Carry the proper gear. There is a new trail connecting the Brush Creek Lot which is the first one you come to on the way out north past the lake, to the east side road and then to Brush Creek. This trail goes north along the east side of the Payette River and then joins the road again about 7 miles out. It will be groomed. There is a sign at the bottom of the hill on the Brundage Mountain Road when the Titus or Upper Elevation lot is full. No parking is allowed on the roadway. Red, Right, Return means the diamonds are on the right when returning to the parking lot (although it depends on where you park!). Generally, this will get you back to a parking lot if you are lost. We are putting out more diamonds as fast as we can to help mark the approved trails. Signage upgrade is also in process. Funds are being applied for in order to get better trail marking and intersections signs. The area on the east side of Brundage Mountain and above the line (old road) between the road to the Summit and Hartley Meadows is out of bounds to sleds. This is part of the permit area Brundage Ski Hill owns and is off limits to us. It is well marked with signs. If you get caught there, you will be issued a ticket. We have thousands of acres of our own to ride in so PLEASE stay out of their areas.